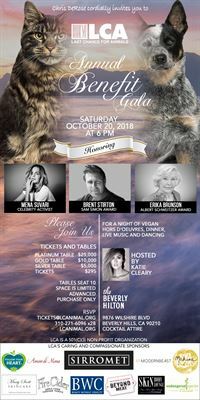 International nonprofit Last Chance for Animals (LCA) is hosting its’ 34th annual star-studded fundraising gala honoring prominent individuals who have made a positive difference for animals. The event will take place on Saturday, October 20, 2018, at 6:00 pm at the Beverly Hilton Hotel in Beverly Hills. Mena Suvari, film and television actress (American Woman, American Beauty) and ardent animal supporter, will receive the “Celebrity Activist of the Year” award. Erika Brunson, world-class interior designer and animal advocate, will be awarded the “Albert Schweitzer Award”. Brent Stirton, National Geographic award-winning wildlife photographer, will receive the “Sam Simon Award,” named after The Simpsons co-creator and LCA’s devoted supporter, the late Sam Simon. The event will be hosted by Katie Cleary, Founder of Peace4Animals, actress and model. Celebrity award presenters and special guest supporters slated to attend include Topher Grace, Kim Basinger, Priscilla Presley, and Donna D'Errico, among many others. Past celebrity and VIP participants have included actress Pamela Anderson, actress Shera Danese-Falk, Virunga National Park’s Prince Emmanuel de Merode and Anthony Caere, model Kenya Kinski-Jones, rock legend Rick Springfield, actress Alexandra Paul, philanthropist and producer Cindy Landon, best-selling author and activist Kathy Freston, radio personality Mark Thompson, journalist Jane Velez-Mitchell, and philanthropists Adam and Amber Tarshis, among several others. The gala will feature a cocktail reception with vegan hors d’oeuvres, followed by a vegan dinner, live music and dancing. For tickets, sponsorship opportunities and additional information, visit http://www.lcanimal.org/AnnualGala. Last Chance for Animals (LCA) is an international non-profit organization dedicated to eliminating animal exploitation through education, investigations, legislation, and public awareness campaigns. Since its formation in 1984, LCA has succeeded as one of the nation’s pioneer animal advocacy groups. LCA’s educational and public outreach programs have empowered the public to make positive changes for animals in their communities. For more information, please visit: http://www.lcanimal.org.